Create a divine garden using White Favourite Spring daffodils, which feature pure white petals. With double-layered trumpet shaped blooms, these Dutch-sourced daffodils look different every day after they bloom. Reaching to 14 to 16 inches tall, plant the mid spring blooming perennials as back borders in flower beds for a lively display. Add the deer-resistant daffodils to your cutting garden to enjoy elegant fresh floral arrangements. Daffodil perennials grow well in well drained soil, but they also tolerate clay, sandy and loamy soil. Plant these graceful beauties in the fall for mid spring blooms, ensuring the bulbs are 6 inches deep and approximately 4 to 6 inches apart for the best results. Daffodils (Narcissus) favour climate hardiness zones 3 to 8, and they require areas where they'll receive full or partial sun. As excellent naturalizers, White Favourite spring daffodils make a stunning addition to meadows and hillsides, giving them plenty of room to spread their beauty. 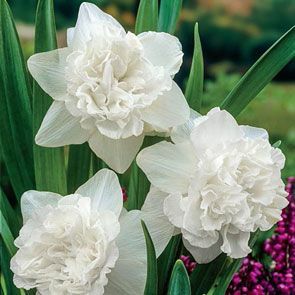 Add these white daffodils to formal gardens, creating colour-coordinated rows for a sophisticated design, planting them with tulips, hyacinths and other varieties of daffodils. Consider planting your Dutch daffodils in between shrubs and hedges to create a dazzling presentation. Embrace the always-changing double-bloomed White Favourite Spring daffodils in your spring gardens. Unfolding layers of petals are a spectacle to behold. 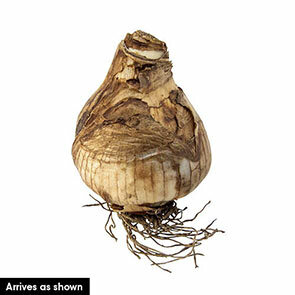 This special daffodil will never look the same from one day to the next! Not just one, but two layers of pure white trumpet petals continuously unfurl to form a dynamic display that will awaken your back borders, naturalizing and cutting gardens, as well as fresh bouquets and indoor arrangements. You'll see just how this gorgeous flower lives up to its name when you see your garden alive with white blooms this spring!